Come on in and make yourself comfortable in our fully furnished 33 square foot house. Did we mention it’s a dumpster? While the project could have been centered around a large cargo container or a tiny house, we decided on the dumpster. A dumpster is the perfect symbol to present themes on waste and consumption in an engaging way. It’s weird. It’s fun. It gets the wheels of imagination turning. Over the course of the first year we transformed the dumpster from a rusty, dirty waste receptacle, to a bare camping box, to a rust-proofed box, until we made our first major interior change and added the false floor. We’ve been through a few design refreshed, wired up the dumpster with sensors that are streaming dumpster conditions. See them here. We changed the roof to help with the leaks, and after 6 months we connected to the grid and installed air conditioning. We don’t know if we ever get to the one final ultimate dumpster. Maybe we hope not to. There is always something to learn and apply to the dumpster, and it’s an experiment. We want to keep changing the design and trying new things. The Dumpster probes and examines and highlights every aspect of home and the environment as a living laboratory. The ongoing dumpster experiment is geared to capture the attention of a wide audience and ignite accessible (and entertaining) dialogue around the concept of living with less. It’s also just one of many platforms in a groundbreaking green campus initiative at Huston-Tillotson University in Austin, Texas. While the dumpster is based in the heart of East Austin it’s also intended to be a mobile house that will move around the state and country on educational tours. Let us know if you’d like the dumpster to make a stop at your school or community event. Our “casa” es su casa! In the final analysis, the dumpster project is a grand experiment that asks: “What does it take to have a happy, healthy life?” Join us on the journey and support the project today. Very good professor! I live aboard a sailboat and have always had tiny if not socially unacceptable housing situations and totally enjoy the simplicity and ease of heating such places… power should be no problem with you, with the LED lights and tiny Li-ion batteries… Try Renogy.com for solar panels…. Thank you for thinking outside the “box”…I couldn’t help myself, and challenging our society to think outside their own comforts. The thing that really hit me while reading about this project is that while for us in the United States it seems ludicrous to walk a mile to get our water or live in a 33 sq ft area, the reality is for many other countries that is a part of their daily life – limited water access and tent/cube housing. With that said, I think it is wonderful to start getting people to ask themselves if they can live with less – which universally the answer would be yes for Americans. But my question is will they? What I mean is, is your goal to create some kind of grid that uses less energy but allows people to have all the appliances and conveniences they are used to or are you trying to prove a point that a dumpster (which under normal circumstances would appear unlivable) or lessening what we think we need, is the key to going green. Maybe we have to give up some comforts but we will survive. 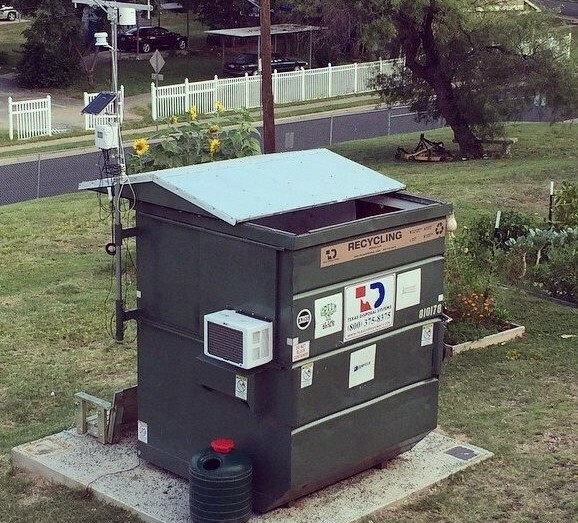 From my understanding , Phase 2 you will allow Professor Dumpster to live comfortably (with appliances like A/C and internet, plumbing of some sort, washing machines, etc) and get the baseline energy use. But then in Phase 3 you plan on knocking that energy use down to 1%. With this, I’m curious if you believe at Phase 3 you will be able to maintain all the luxuries of Phase 2? But my big question remains: can we have our cake and eat it to? Or is the more realistic picture that in order to become sustainable and greener, we need to actually use less. We would love to have a visit from your completed dumpster habitat in Richmond, CA, the largest city in the USA with a mayor from the Green Party. We would love to come visit. Stay in touch and when we get the Dumpster mobile, we can talk in detail. Thanks! Well done this is an inspirational project. Have look at this article. This is further food for thought. Will the dumpster be close to WiFi? We can live small but we still need are internet we lived five people in 600 sq feet we would share one pair of head phones between 2 people to watch Netflix on a 13′” laptop . Bill, you’ve actually hit on a really good question. It turns out that sending a WiFi through a giant metal box is a bit of a design challenge. We’re already thinking of ways to get around it so that Professor Dumpster will have internet access (a necessity that falls right after food and water). Sounds like you’ve got some experience with living in small spaces. Thanks for your comment! If you’ve got ideas we’d love to hear them. This is such a great idea. We don’t hear enough about sustainable and affordable housing; just rising home prices as the corporate media concentrates on only that. We need to address housing as a need, a right – not an investment only. Thank you for your focus on this important idea. Also I would like to recommend a website, Terrabuilt.com. Their focus is on sustainable and green housing as well. My father has been involved with this company and I hope they will expand their efforts in America.. Your website is beautifully designed. I am looking forward to coming back and visiting to see the progress. Good luck! Thanks for the feedback, Elizabeth! It would certainly be ideal if sustainable housing was available to all communities. We appreciate your support and look forward to sharing the adventure. Love this! I thought I lived small in my 1100sq/ft house, but this marvelous structure has mine beat all hollow. However, I do also have a 21ft Toyota Mini-motorhome which I just might move into. That would get me closer at about 130sq/ft…….